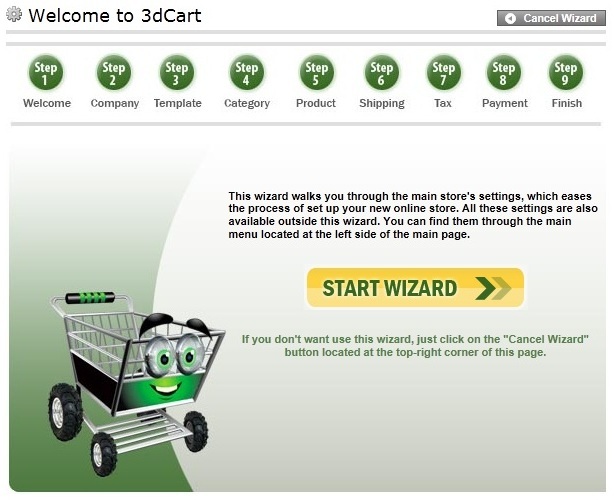 3DCart is a popular remotely hosted shopping cart solution. Like competitors Big Commerce and Shopify, the focus is to provide merchants with a powerful shopping cart platform that can handle the requirements of most small and mid-sized businesses, while being very easy to use. In terms of industry relevance, 3D Cart is a well established solution that has been in business for over 10 years, and boasts an impressive portfolio of more than 10,000 customers. As a remotely hosted cart solution, 3D Cart does not need to be downloaded or installed. You do not need to purchase the software. Instead, it is a subscription model in which the store is hosted directly by 3D Cart, and you pay a monthly recurring fee for them to host the store. This means that there is no complicated setup, and no need for patching or other security updates. Most remotely hosted cart solutions are targeted towards businesses that want an easy to use solution that will meet the needs of their online store. 3D Cart follows this model, with a cart administration interface has been built to try to get business owners off to a running start. When logging in to the administration area for the first time, the first thing you'll see is the setup wizard, which will guide you through a 9 step process of building your store. While there are 9 steps in total, you can easily skip steps that you don't want to do right away and return to them later. For advanced users, you're given the option of skipping the wizard entirely and customizing the cart to suit your needs. The first step is not really a step at all -- rather, it's a welcome page that introduces you to the interface and demonstrates the steps involved in building your store. Step two involves entering basic company information such as your name, address, phone number, etc. Step 3 is where the work begins. You must start by choosing a template design for your store. There are a fairly wide range of templates available that with little to no modification would fit several popular online retailing themes (jewelry or health products, for example). Some templates are free, and there is a catalog of premium templates that can be purchased for an extra charge. Once you've picked a template that you like for the most part, you can leave it as-is, or easily tweak it by editing the HTML and CSS right from within the 3DCart store manager. One of the drawbacks of most remotely hosted carts is that because you do not have access to raw code it can significantly impede the ability of a developer to get in and customize functions, look and feel. 3D Cart scores fairly well in this department because of a well thought-out css editor and text based access to the raw HTML code. There are several different ways within the cart to customize the look and feel of the store, from a simple drag and drop GUI that is perfect for non-techies, to full control over the HTML and CSS used in the design of the template for more advanced users. The drag-and-drop design works fairly well, with most of the basic elements of the page (navigation, product placement, etc.) being easy to reposition. However, the GUI is not good for much more than repositioning or deleting basic navigation elements and page layouts. The advantage of dragging and dropping is that it allows you to quickly visualize and test different layouts. For example, if the template you chose has a navigation bar at the top left of the page, but you would like it to be in the top right instead, you don't have to play with any code. Instead, you can simply use the quick edit bar to drag the menu from the left to the right of the page and then save it. For developers who want to roll up their sleeves, there is a well thought-out style sheet editor. In fact, I found the style sheet editor to be refreshingly well thought out because it contains a plain English description of which elements on the page each CSS field controls. One of the drawbacks of using a template-based system can be a frustrating inability to find which element controls which part (and which pages) on the website. For example, trying to change the headline on the shipping confirmation page with some carts can be extremely frustrating. In this department 3D Cart was surprisingly easy to use, because the css was thoughtfully arranged and well documented. Steps 4 and 5 involve the process of creating product categories, and populating these categories with product information. When uploading product images, 3DCart will automatically create thumbnails from the high resolution images that you upload. Another nice feature that stands out is a feature called 3D Zoom, which lets customers view a high resolution magnified view of a product image when hovering over the smaller image. This lets the customer get a very detailed view of a product which could be advantageous for retail sites trying to demonstrate the quality of an item. For example, it can be used to show off stitching on clothing or other small attentions to detail that would not normally be visible in a smaller image. There are a wide range of shipping methods available to configure within 3DCart. UPS, Fedex, USPS and DHL are included. It's specifically worth mentioning that 3D cart is Canadian friendly with support for Canada Post real time shipping calculations. In addition to the real-time shipping modules, it also includes support for custom shipping logic. For example, the cart can determine shipping based upon a fixed amount, or by a percentage of the subtotal, as well as other options. Shipping labels for certain carriers can also be printed from within 3DCart as well. The advanced shipping logic (especially the real time shipping quote logic) appears to be quite well implemented. Oddly though, it was difficult to setup much simpler shipping logic such as flat rate shipping to any destination. This could be because more online merchants are moving towards support of real time shipping quotes, however it would have been nice if the non-real time methods had been a little more intuitive to use. Configuring tax rates within 3DCart is very easy. You just select the country, and then the province or state, and then the tax rate. You can setup individual tax rates for every region that you do business in manually, or you can use one of the free tax manager apps that 3DCart offers which automatically determine the proper tax rate to apply based on the customers information. Step 8 allows you to configure the payment methods that you wish to enable. 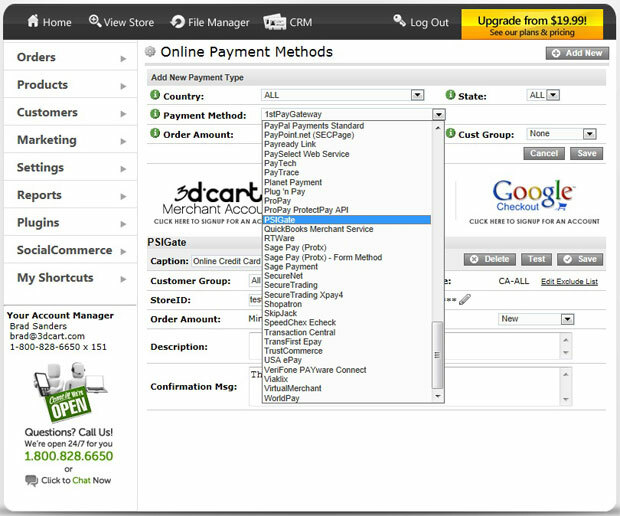 3D Cart is fully compatible with Merchant Accounts.ca payment processing services. It also supports a good number of popular gateways such as Authorize.net and WorldPay. It integrates natively with Paypal, and is quite Canadian friendly. In addition to Merchant Accounts.ca it also ties into Beanstream, PSiGate, Moneris and other popular Canadian payment gateways in addition. Offline payment methods are available too, allowing your customers the option to pay by cheque or money order. The last step (step 9) is just a confirmation to leave the wizard and enter the stores regular administrative interface. The wizard is helpful for customers who are new to building an e-commerce website because it guides through the important steps needed to configure the store and get it live. One criticism worth noting is that in testing I noticed that once you've completed the wizard it disappears. After initially setting up the cart, I wanted to go back into the wizard to work through it and make some changes but could not figure out how to start it up for another run-through. Fortunately, any settings configured in the wizard can easily be changed later through the regular administration system, so this is not really a problem - though I would have liked the option to use the wizard again. With our 9 step build complete, we can now look at what the store is like to work with on a day-to-day basis. 3DCart has a handful of social media features built in. You can easily add your store to your Facebook page and display products for sale. Of course, there is a 'like' button that can be enabled so that customers can like your products and recommend them to their friends on Facebook as well. Social bookmarking allows your customers to share products and promotions and boost traffic back to your site using many different social media networks. You can also create and manage your own blog within 3DCart. The administration page lets you create new blog articles and a short preview post for each article all in one place. There is a Facebook Store app for 3DCart that lets you list up to 49 products from your 3DCart store right on your Facebook page. Customers can view the products and add them to cart right from the Facebook Store. I wanted to try this feature out for myself so I clicked on the Facebook Store menu item from within my 3DCart control panel and it prompted me to download a PDF for detailed instructions on how to setup the Facebook Store. This was the only time in which a problem stopped me from proceeding during the review of the cart, because the PDF download link was broken and redirected to a 404 'Page not found' error. Rebuttal Note: Management at 3DCart have informed us that this broken link was a result of us using the system in test mode, and that if the store had been set in live mode (non-simulated transactions) the link would not have been broken. 3D Cart touts the importance of social marketing on their Youtube channel, pointing out that customers are statistically much more likely to purchase a product or service if it has come recommended by their friends on Facebook. Social media is clearly a feature that is important to the developers and product planners at 3D Cart, and I expect these features will continue to be developed and fleshed out as development continues on the product. 3DCart has taken the time to make certain that the cart is search engine friendly. One of the disadvantages of older hosted cart solutions is that dynamic product data was hard to spider because the website URL structure was a series of gobbledygook query strings. 3D Cart addresses this problem by creating static HTML URLs for each of your pages so that search engines can spider them more effectively. It also adds relevance by allowing keywords to be included in the URL structure. Further SEO tweaking is possible with the option of manually including meta data for each product. While adding meta tags is of some benefit, business owners interested in an organic search engine result should focus on creating store URL's relevant to each product, and to make certain that a useful and relevant product description is included on each page. Overall, 3D Cart management clearly understand the importance of providing a SEO friendly platform, and have provided business owners with a good framework in which to work from a SEO perspective. As is the case with all hosted cart solutions, the setup and administration of your store (such as the uploading of product images and modifying store settings) is done entirely through the web browser. Site administrators also receive FTP access to the website, so that file management can also be done through FTP in addition to through the browser. A mature cart solution has many different options built in, so a well organized dashboard is important. Fortunately, 3DCart has a logically organized menu system that is easy to navigate. There are many features and settings and options that you may or may not wish to configure within the cart. All of the features and settings of 3DCart are grouped and organized into 8 main categories, along with an extra shortcut menu that that you can customize to add shortcuts to your most frequently used features. The menus are thoughtfully organized, making it a breeze to browse through the menus to find what is needed. One small, but particularly nice aspect of 3DCart was that the system store doesn't log you out after a period of inactivity. This is important if you are consistently returning to the administration settings throughout the day. As far as user control goes, multiple user accounts are supported with different permissions. For example, you can create an account for your web designer that will enable him or her to make changes to the design of your cart, but restrict their access to customer information or sales information that they do not need access to. When using a remotely hosted cart it is important that the system is fast and responsive. In terms of speed, I experienced a little bit of lag upon first logging in. Pages were not timing out, but working through the wizard at first was a little bit slow. However, in further testing no more lag was noticeable and the system was very responsive. It is quite possible that the lag was from my internet connection as opposed to being on 3D Cart's end. Aside from that once incidence the system was speedy and snappy over the next several days during testing. A good platform is half the solution, but it's not worth much without support. Our experience with 3D Cart support was a positive one. 3D Cart does not charge for phone support (extremely important for small and mid-sized businesses!). In particular, in the bottom left corner of the store manager you are provided with direct contact information for a dedicated account manager. You are given your account managers name, email address and phone number with direct extension - a nice feature which provides the added accountability of dealing with the same account manager each time you call, as opposed to speaking with a different customer service representative each time you call with a question. This may sound like a small feature but demonstrates a commitment to customer support that is important when selecting a cart provider. 3D Cart also maintains a YouTube channel with more than 50 tutorial that demonstrate specific features of 3DCart. Some of these videos provided basic information, while others go beyond basic store configuration setting to provide helpful internet marketing advice and guidance. From a customer support perspective, 3D Cart have attempted to provide a platform that will help small business owners succeed online. There are 5 different pricing plans available to choose from with 3D Cart ranging from $19.99 to $129.99 per month. The least expensive plan limits the number of products you can offer for sale in your shopping cart to 100 and has a bandwidth cap of 2GB. The medium level plan is $49.99 per month and according to 3D Carts website it is the most popular choice. This plan has a limit of 1000 products and a bandwidth cap of 6GB. It also adds online chat support which is not present in the lower cost plans. The most expensive plan supports unlimited products, 45GB bandwidth, online chat support and QuickBooks Plugins. 3D Cart also gives you the option to pre-pay for a full year of service up front and save about 15% off the monthly fee regardless of which plan you choose. Comparing to popular competitors Shopify and Big Commerce it is priced in under Shopify (which charges a % of each sale) and more than Big Commerce (which provides unlimited bandwidth). From a cost to value perspective each of the carts is a strong contender, and would likely come down to a matter of personal preference in terms of which cart is the best fit for a particular project. 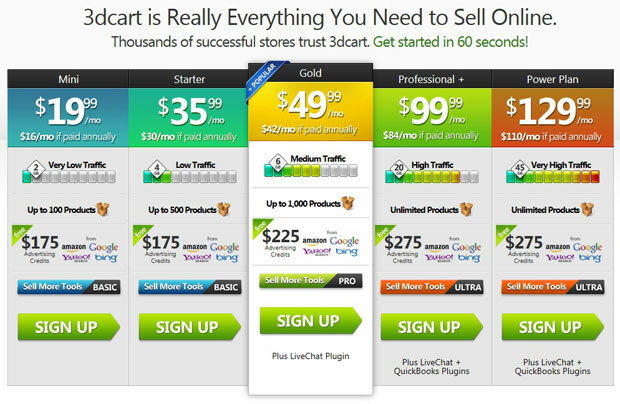 In conclusion, 3DCart is a well thought out, feature rich shopping cart solution, and should be considered by anyone that is looking for a remotely hosted cart solution. The administration interface is intuitive and the cost is in-line with industry standards. It is easy enough for a novice to use, while still having a reasonable amount of access to pure code for advanced users and web developers to do more advanced customizations to the store. You can try out a free 15 day trial of 3DCart yourself at www.3dcart.com.